Dubai: Debutant Abid Ali and inform Mohammad Rizwan cracked centuries to almost snap the victory run of the Australians but Pakistan lost by six runs after a spectacular chase in the fourth One Day International match of the five match series at the Dubai International stadium. This stadium’s ten anniversary match turned out to be a memorable one with Pakistan chasing Australia’s impressive total of 277 for 7 in 50 overs made through Glenn Maxwell’s superb 98. Maxwell unleashed his unconventional shots to entertain the fans and put on a record 134 runs partnership for the sixth wicket with wicket-keeper batsman Alex Carey to give Australia a challenging total. Maxwell displayed his reverse sweeps, scoop shots and his exquisite pull shots during his 82 ball knock studded with nine boundaries and three sixes. Carey, who scored his maiden One Day International half century hit 55 runs off 67 balls with three boundaries during his 21.1 over partnership with Maxwell that lifted Pakistan to a respectable total. Maxwell got tragically run out just two short of his century through an accurate Shan Mashood throw from deep to wicketkeeper Mohammad Rizwan while attempting a second run to a hit high over backward point. Though Pakistan had lost the series to Australia after being beaten in the first three matches of the series, they came strongly through an inspired performance by a Lahore-born Ali who had to wait till the age of 31 to make his international debut. He scored 112 runs off 119 balls with nine boundaries to become only the third Pakistan batsman to score a century on ODI debut and put on 144 runs for the third wicket off 24.4 overs with Rizwan. 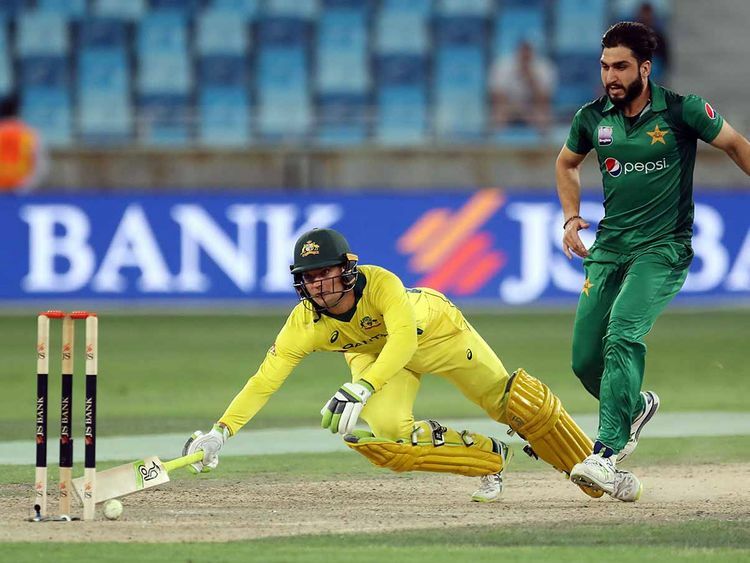 Ali, who also became the 15th batsman in the world to score a century in ODI debut, fell when Pakistan needed 60 runs off 53 balls slog sweeping Adam Zampa to Australian skipper Aaron Finch at long on. Rizwan, who cracked 115 runs in the second match of this series at Sharjah, played some beautiful well timed sweep shots and scored 104 off 102 balls with nine four and a six. After Ali fell , he saw the quick fall of Umar Akmal for 7, playing Nathan Coulter-Nile on to his wicket, debutant Saad Ali (9) skipper Imad Wasim (1) and he too fell in the last over. Pakistan had lost opener Shan Masood for duck to fifth of the first over form Coulter-Nile but Haris Sohail and (25) and Abid Ali put on 74 runs in 15.4 overs. After Sohail became a Nathan Lyon victim, Rizwan and Ali fought valiantly. Earlier, skipper and opener Aaron Finch and Usman Khawaja gave a good start through a 56 runs partnership. Khawaja went on to hit 62 runs off 78 balls while Finch fell for a quick 39 runs. Pakistan skipper Imad Wasim, who led the Pakistan side for the first time in the absence of Shoaib Malek owing to a rib injury, won the toss and elected to field. Pakistan introduced two more debutant in Saad Ali and Abid Ali. Finch began with a superb shot off the third ball of the match by going on to his toes and hitting Usman Shinwari square of the wicket for a boundary. Left-handed Usman Khawaja too played a similar shot off Shinwari . Junaid Khan beat Khawaja twice in the fourth over. Finch began to play some glorious drives all along the ground off Shinwair and Junaid as Khawaja played second fiddle. The 50 runs partnership came in 11.2 overs with Finch dominating the batting with 36 runs. The pair put on 56 runs in 12.1 over when young Mohammad Hasnain trapped Finch leg before for 39 with sheer pace. The ball hit Finch’s pad in front of the leg stump and the skipper walked without even reviewing the umpire’s decision. Shaun Marsh, who joined Khawaja, lasted only 16 balls to scored five runs when Imad Wasim had him stumped by wicketkeeper Mohammad Rizwan. Peter Handscomb and Khawaja added 33 runs in 5.3 overs before Wasim struck again to have Handscomb caught at slips by Haris Sohail for just seven runs. When next man Marcus Stonis too fell, clean bowled by Yasir Shah’s googly, Australia slipped to 101 for 4 in 22.1 overs. Khawaja reached his ninth ODI half century in 64 balls. Glenn Maxwell , well known for his ability to hit his team out of trouble, lifting Shah for a six over long on. At the half way mark, Australia were 120 for 4 with runs not flowing easily as in earlier matches.